My friend Ann gave me the original recipe, which apparently came from Food & Home Entertaining magazine, after another friend raved about it. The filling was just leek and sweet potato, and I added some protein and herbs in the form of chicken and rosemary (I cooked chicken breasts from scratch but you could use left-over chicken if you have some on hand). I also substituted Greek yoghurt for the original crème fraiche. You could still use crème fraiche if you prefer, but I find the yoghurt a bit lighter and it adds a slight tang which works well. The recipe originally called for pastry above and below, which would end up more like a traditional pie you could buy in a shop. If you love pastry, feel free to give that a try by cutting out two pastry rounds and gluing the edges together with egg once you’ve put the filling in (careful not to overfill it though). Personally I was quite happy with the pastry just on top as the filling is already thick and comforting. 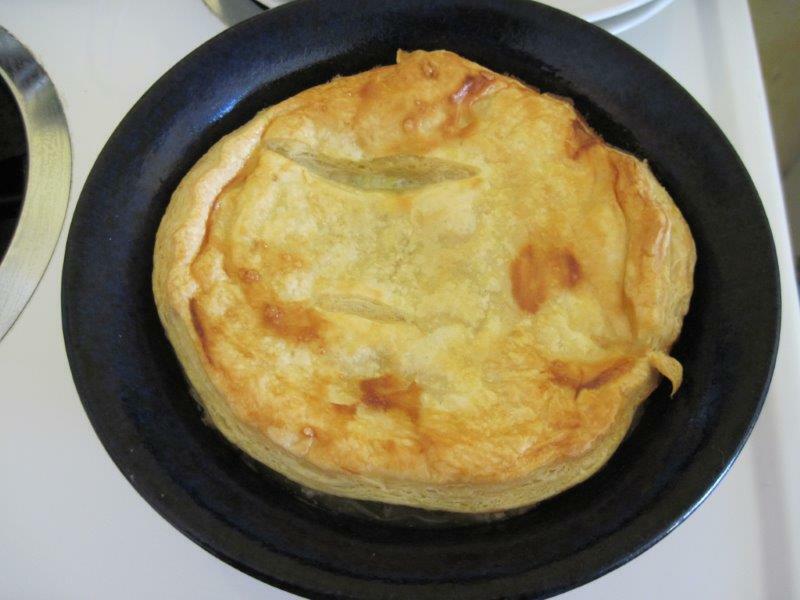 If you want to prepare it mostly in advance, I would suggest rewarming the filling in a pan (stir very gently) before putting it in the oven-proof bowl, and only putting the pastry on top just before you put it in the oven. That way your filling will be nice and hot by the time the pastry is risen and golden. That combination of soft filling and crispy topping can’t be beat! 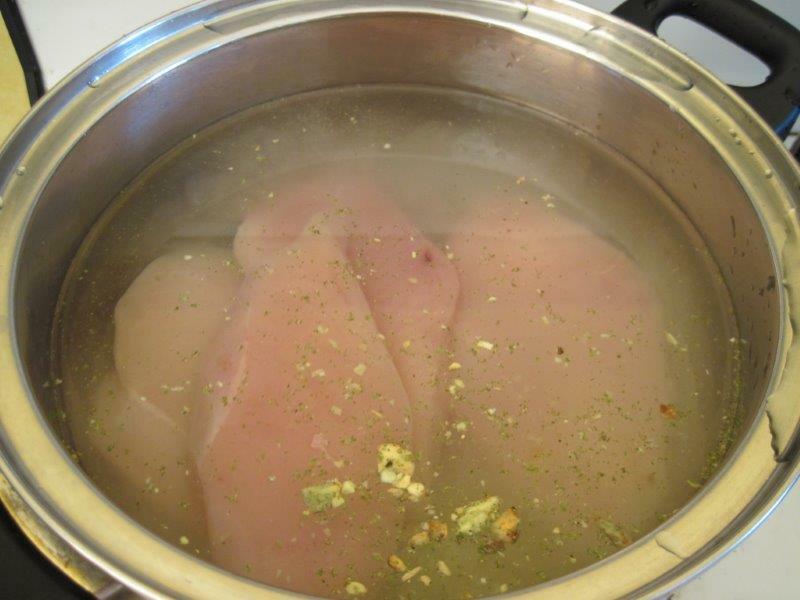 Place the chicken breasts in a pot with the stock powder and cover with water. 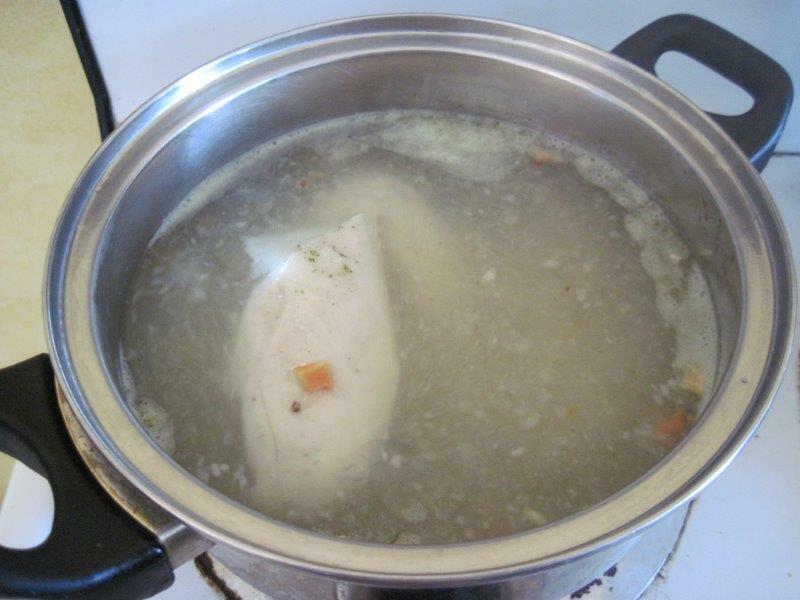 Bring to the boil and cook until the chicken is cooked through – usually about 20 minutes. 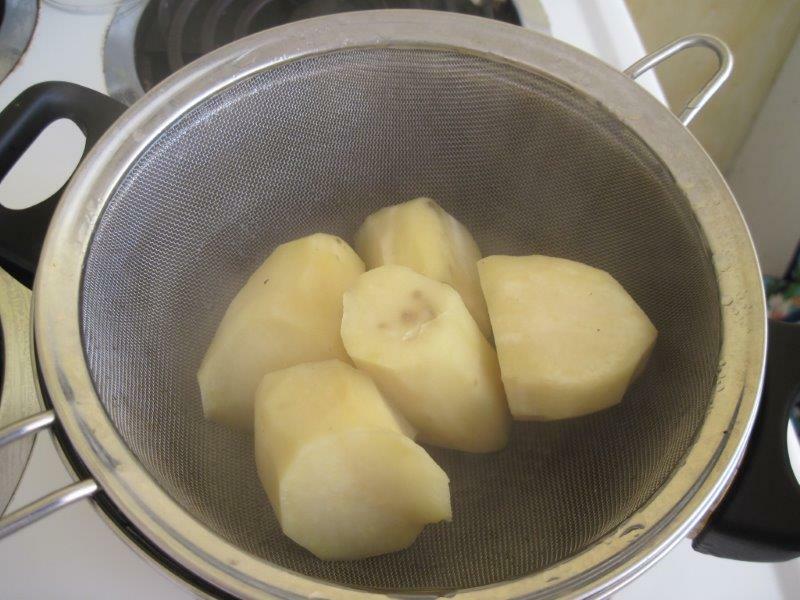 Chop the peeled sweet potatoes into halves or quarters, depending on how big they are, and put them into a sieve over boiling water to steam until cooked through (or use a steamer if you have one). Note: Don’t peel them too long before you’re ready to cook them as they go brown, and preferably don’t boil them directly in water or they get too watery and start to fall apart. Sprinkle some flour onto a board or your clean counter-top and carefully unroll the puff pastry onto it. 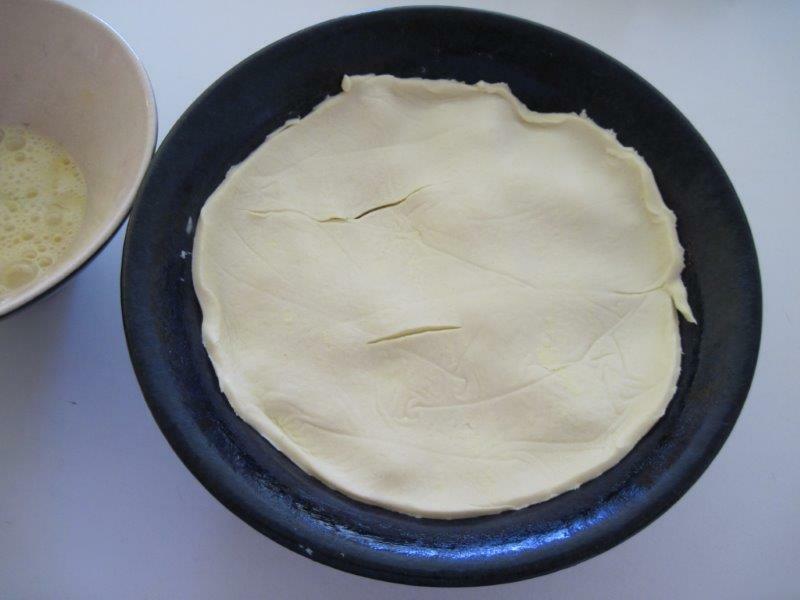 Turn the oven-proof bowl or pie dish you are using upside down and use it to very gently mark out a circle of about the same size on the pastry. 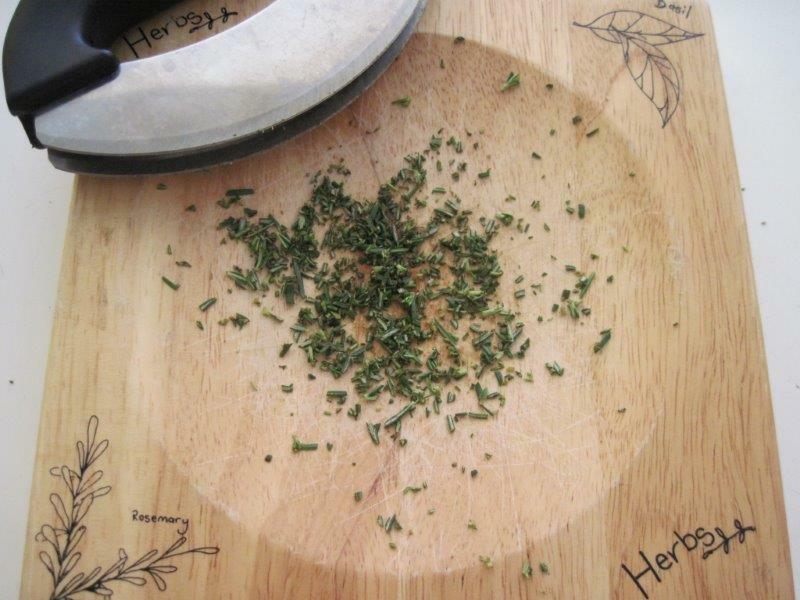 Then cut just inside those markings so the circle will fit into the dish. (Sorry, I didn’t get a pic of this!) Return the circle of pastry to the fridge for now, and save the remaining pastry for another use. 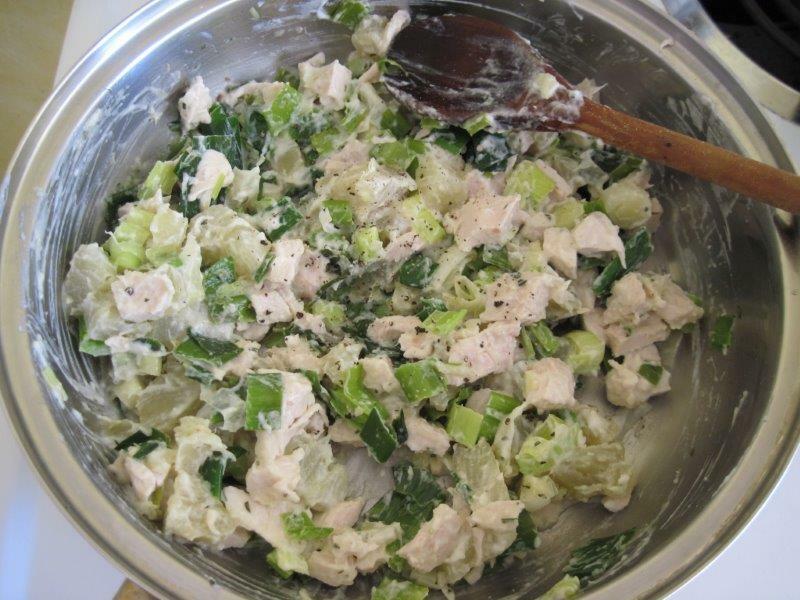 Now grease your oven-proof bowl or pie dish and set it aside. 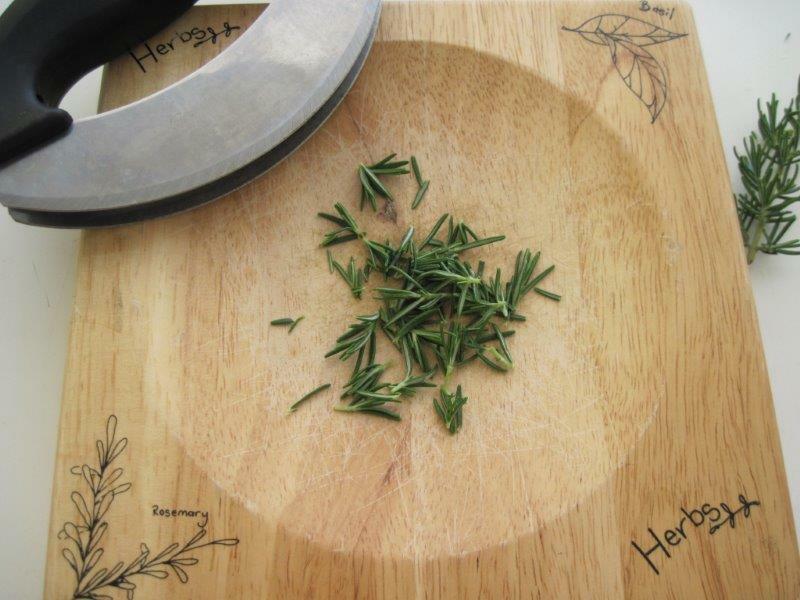 Take the rosemary leaves off the stalks and chop them finely. 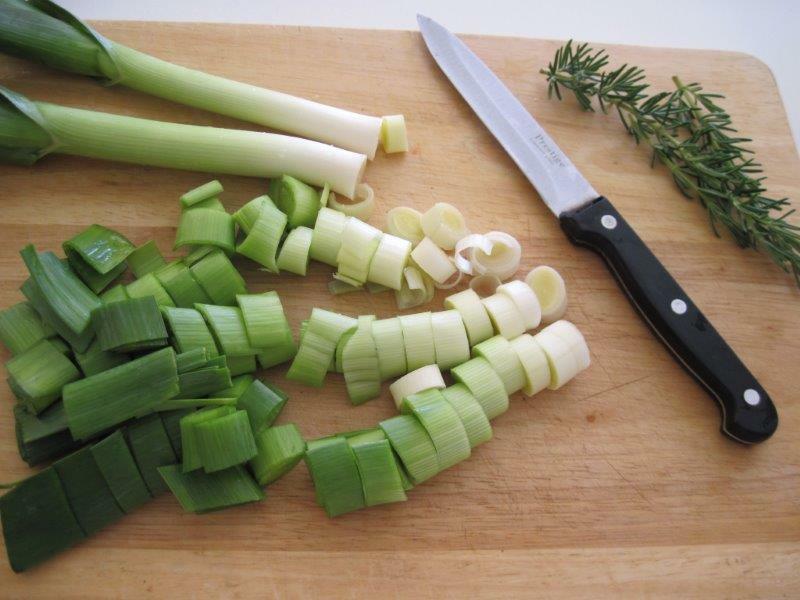 Using a curved herb knife works well for this, but you could also just use a normal sharp knife. 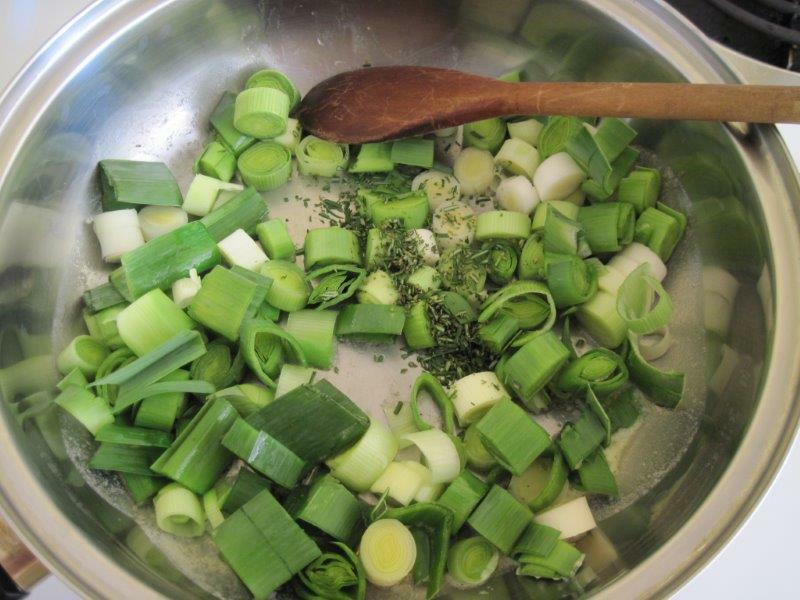 Heat the butter in a frying pan and add the leeks and chopped rosemary. 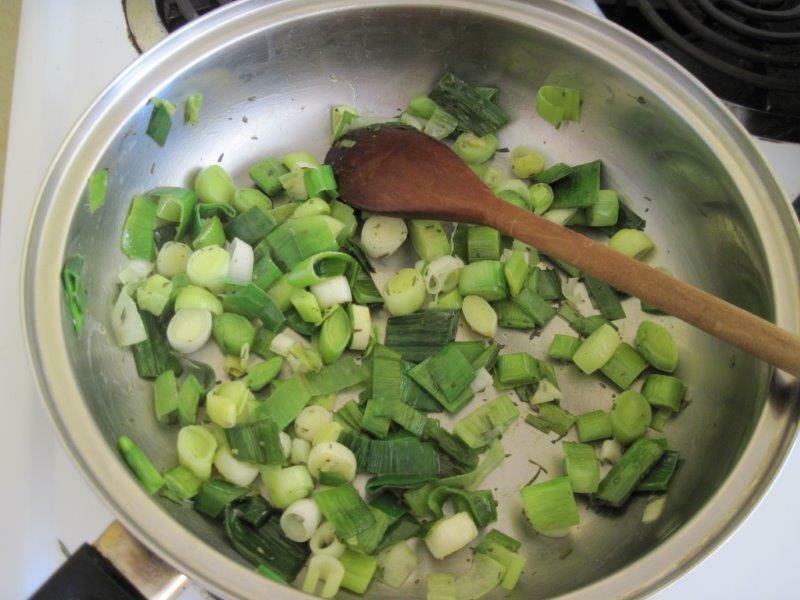 On medium heat, cook until the leeks start to soften. 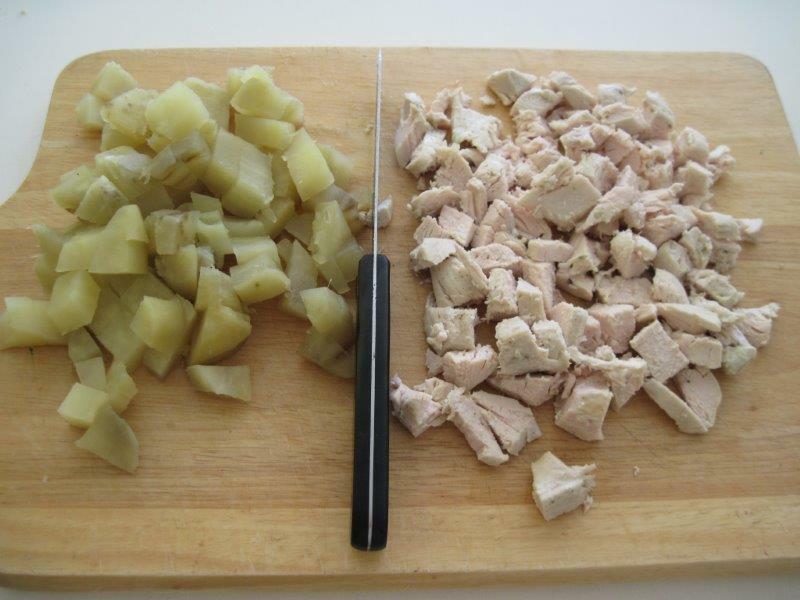 When the chicken and sweet potatoes are cooked, chop them into cubes. 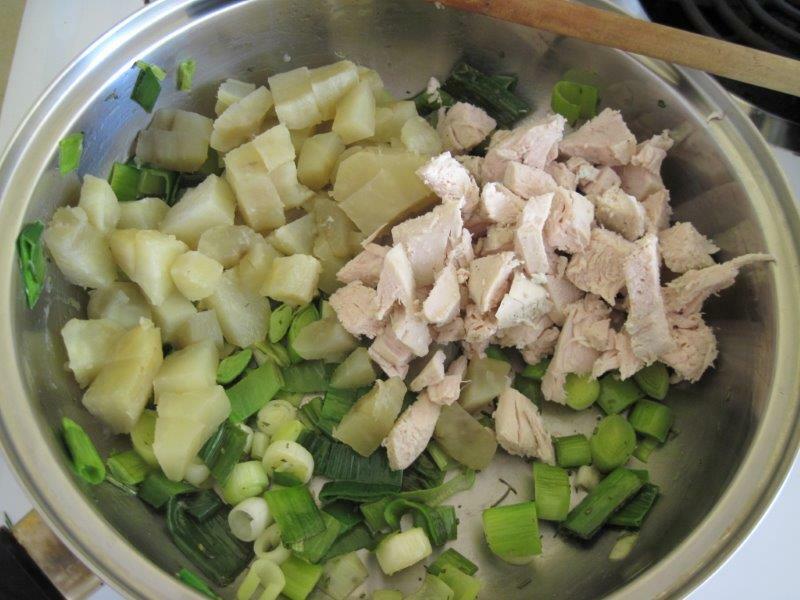 Add to the cooked leeks and stir gently, trying not to break the sweet potato up too much. 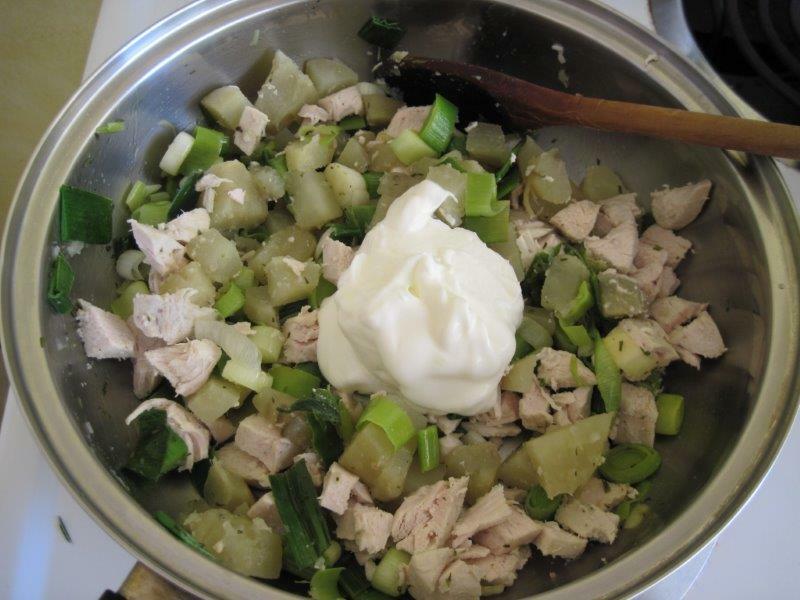 Add the yoghurt and stir gently again. 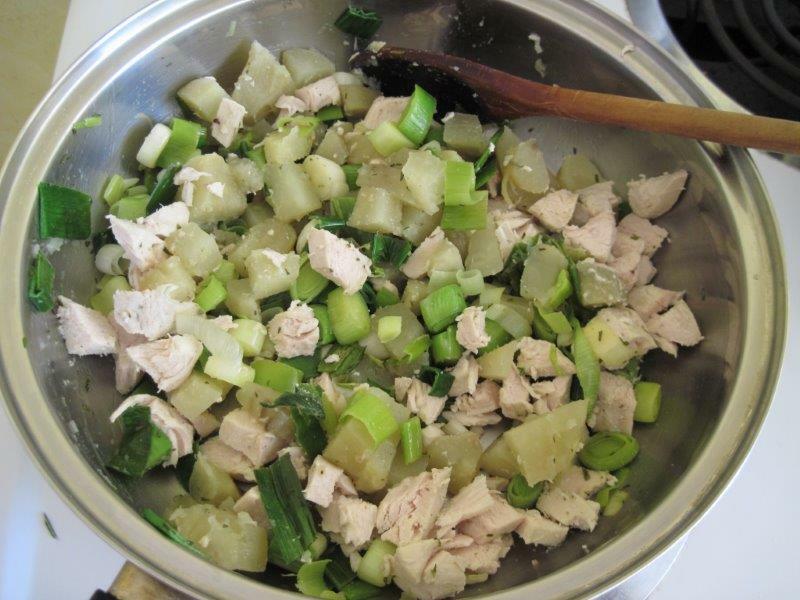 Add salt and pepper to taste now. 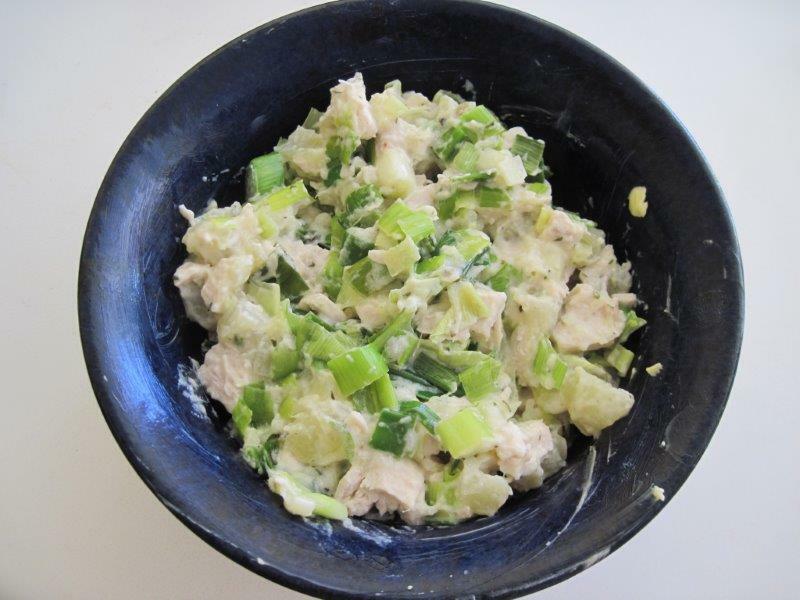 Place the mixture in the greased oven-proof dish. Gently lay your circle of puff pastry on top. If you like, you can use a sharp knife to mark out patterns in the pastry (I left mine plain here but you can see the unintentional pattern in the finished product where the pastry had cuts in it). Whisk the egg and use just a little of it to glaze the top of the pastry. A pastry brush works well here, if you have one, otherwise use the back of a big spoon or your fingers. Bake until the puff pastry is risen and golden, probably 20 – 30 minutes, by which time the filling should be nice and hot too. Looks good Alex – definitely worth a try by this appy chef! Thanks.